Oblique House is a new-build sunken home accessed off Evelyn Road in Richmond. From a derelict site we created a contemporary family home with the benefit of its own private garden. External cedar cladding is mimicked internally where six metre timber battens form a staircase and create a feature wall. A frameless structural glass roof floods the house with light and allows the timber box to float when viewed from the courtyard. Internally the design has a subtle industrial vibe with a mix of warm copper and cooler blue/grey tones. 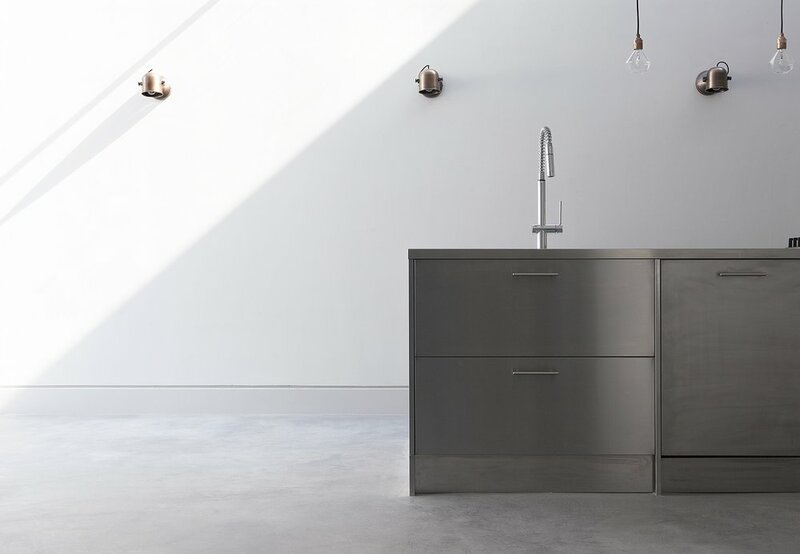 This includes design elements such as the bespoke stainless steel island, industrial lighting fixtures, micro-metal copper finishes to the walls, metallic silver tiles and exposed gunmetal rivetted steel work.